September is House Beautiful‘s fall color issue and I was thrilled to see the cover features a spectacular project in nearby Greenwich, CT by designer Ashley Whittaker . In a beautiful new house designed by Judith Larson with stunning architectural details, Whittaker shows that pretty can be sophisticated and modern with a serene refreshing palette of blues and greens. 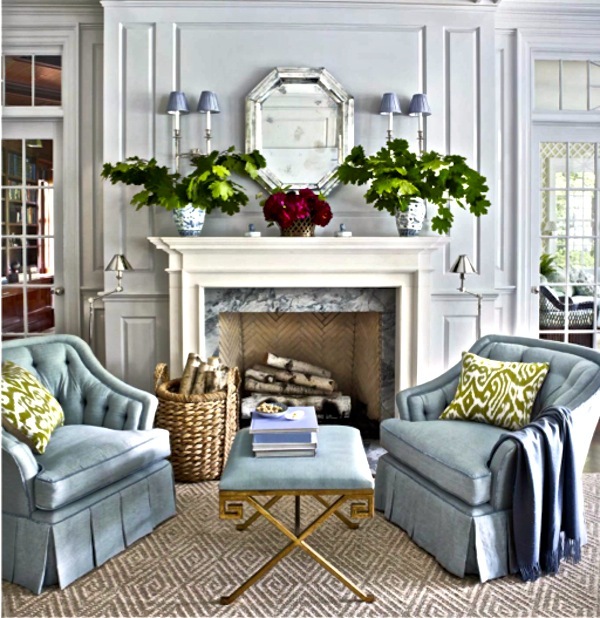 The gray lacquered walls in the living room set a neutral background for the elegant cool tones. I love the contrast of the glamorous gilt of Currey & Company’s Circe bench against my favorite sisal pattern – this one from Mansour Modern. The green accents in the pillows prepare for the segue to the sunroom through the french doors. I have always wanted to have a trellissed room a la Elsie de Wolfe. Here it looks updated and fresh against the Pantone Young Wheat walls. This room is such an enviable mix of color and pattern as well as an effective combination of high and low – note the X benches from Ballard covered in Kathryn Ireland’s Casablanca. Oomph’s charming Fenwick coffee table keeps the center of the room interesting yet light. With a floor plan that openly connects the room, the adjacent pastel spaces are grounded by the chocolate brown dining room, where traditional furniture with a twist (the pedestal table is oval) and fixtures are updated with a creative wall treatment – brown lacquer painted over with a bronze vine. 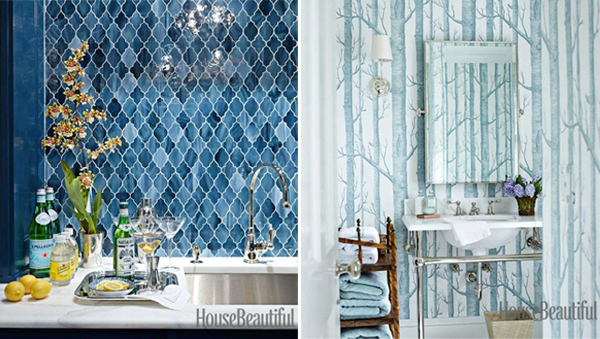 With texture and pattern, Whittaker can make her blues shine with exotic glamour or play quietly in nature’s imagery. I am wild about this Waterworks Moroccan inspired Aladdin tile backsplash in the bar – it’s timeless yet current! A custom colored version of Cole’s Birch Trees wallpaper makes you feel as if you are in a cool wintery scene. 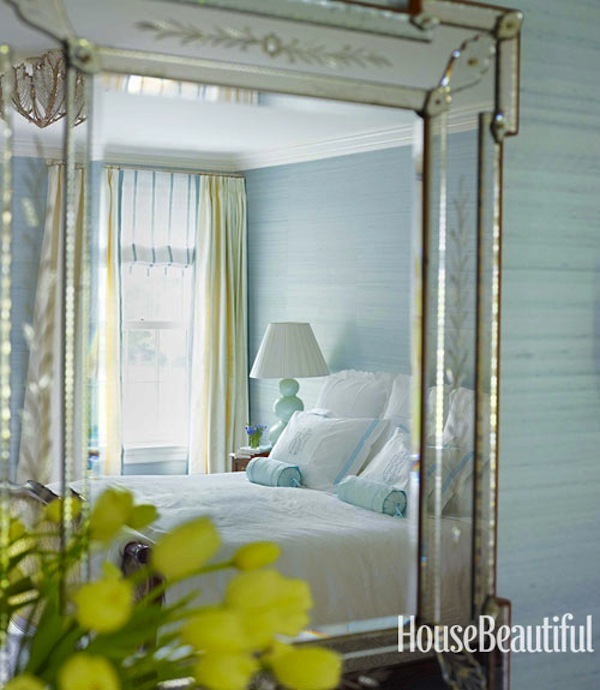 “Lavender has a whole new point of view when it’s mixed with turquoise and navy. It says ‘girl’ without screaming ‘girly girl.’ ” I’m sure my college age daughter would also adore this boho chic bedroom. The statement making Quadrille Suzzani sets the bold tone for the room against Benjamin Moore‘s Mountain Mist. The master, on the other hand is all about cool, soothing serenity. Here it’s turned down a notch where contrasts are achieved through subtle textures and tonalities. Phillip Jeffries‘ Star Dust Silk wallcovering has a cocoon like effect with light window treatments that whisper eloquently in Scalamandre‘s elegant Bonard with shades in Carlton V‘s Sophie Sheers. I think we all love a little pretty when it’s tempered and executed with elegance and expertise!! 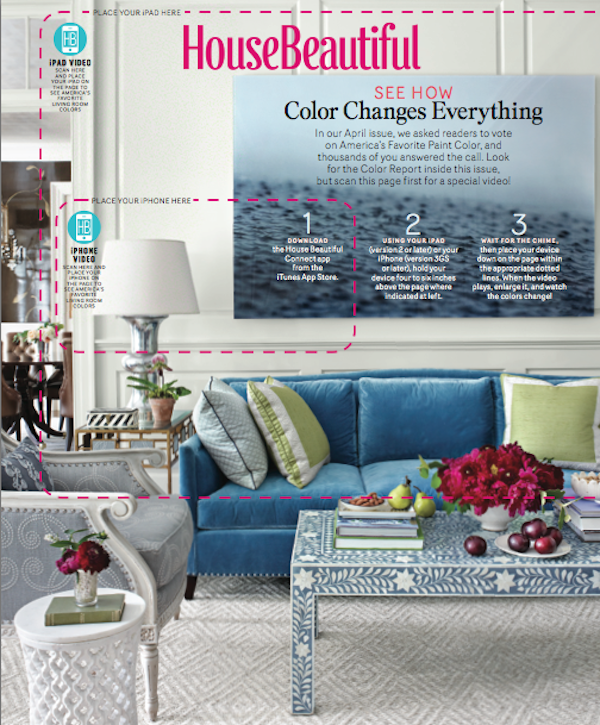 And you’ll be able to see more in depth information about the project with House Beautiful’s innovative integration of technology – be sure to check out the special features when you get your September issue – enjoy!! This entry posted in architecture, design, games, interior design. Entry Tags: House Beautiful, interior design, Kathryn Ireland, Mansour Modern, Oomph, Pantone paint, Phillip Jeffries, Quadrille, Scalamandré Bookmark the permalink. 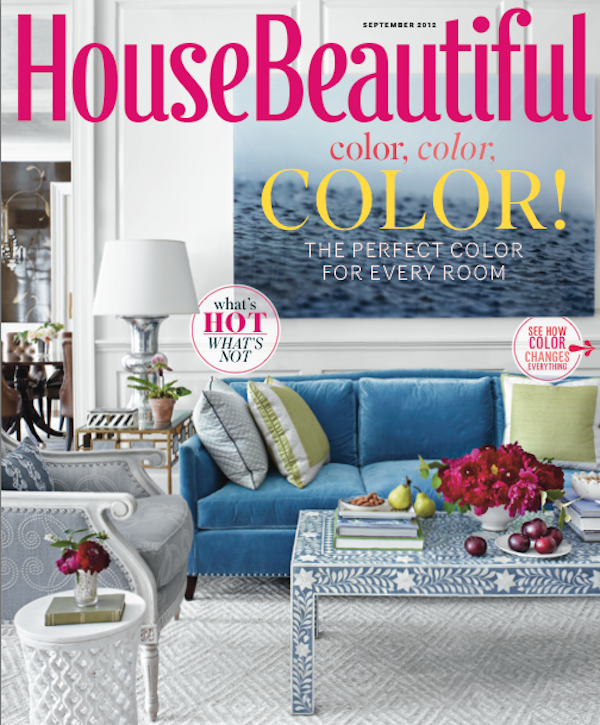 LOVE seeing our dear friend Ashley once again on the COVER of House Beautiful – what a gorgeous home she created!! LOVE everything about this home, and i am about to pin away!! Love her work!Happy Wednesday. Looking forward to getting my copy. (I can’t believe it’s time for the September issues already!) What a bright, cheerful and chic home. I’d love that turquoise and lavender bedroom! I will be pinning away! Love this house! Great post! Woohoo! Go Ash. Love the color throughout. So divine and soothing…like a vacation for my eyeballs! Thx for the preview Q. What is not to love about every single room in this post! Ashley is sheer genius when it comes to color, texture and pattern. Have pinned every single picture! The birch trees wallpaper is so great, as are the lacquered dining room walls, the Moroccan backsplash, and the trellissed room…it feels like home…classy, chic, & comfy. I love it all! I always love everything you feature and I have to refrain from popping every single image into my computer files. AW is such a gifted designer-having just read “The Great Lady Decorators” I just loved seeing the trellis-Elsie would indeed be thrilled! Catching up on some of your other posts too and the images and descriptions are incredible! Thanks for a great sneak peek!! Such beautiful spaces, and the trellisse room is spectacular!! I love the dining room! and the bar back splash is beautiful! Thanks for all the scoop! I LOVE her work. Was so excited to see this house featured in HB. 79 queries in 0.523 seconds.